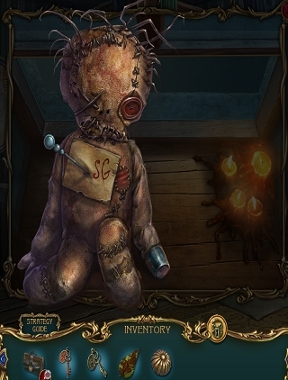 Haunted Legends: The Secret of Life has the full laundry list of usual hidden-object adventure mechanics... the fully customiseable difficulty, a map that lets you jump to unlocked locations at a click, and even casual or hard settings for some puzzles. 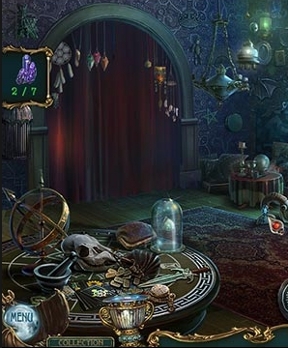 The hidden-object scenes aren't always simple lists of items to find... you may use specific items in the scenes to advance through a piece of the narrative, or track down all ingredients for a potion scattered throughout a room. 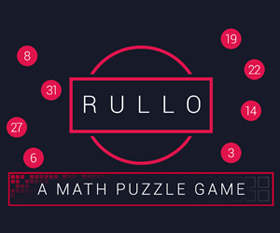 Chances are you'll have seen variations on the puzzles you'll encounter before... assemble a torn photo, slide things around on fixed tracks to their correct places, slap the heck out of an unconscious man because water is for sissies. But while a lot about Haunted Legends: The Secret of Life is familiar, its setting and pacing are so crazy that there's still a lot to enjoy. Within moments of setting foot in town, you're seeing people brutally attacked by a spectral woman, finding beating hearts in statues, discovering bloody voodoo dolls in your hotel room, and given a list of magical ingredients to gather, all within the first fifteen minutes of play. It's not that it's not interesting, it's that it feels rushed and hectic, bouncing you from one bizarre scene to another like a hyperactive toddler showing you things from their toybox. Surprisingly, where it might ordinarily make you feel impatient and disoriented, Haunted Legends: The Secret of Life still manages to be weirdly compelling thanks to some great visual design and supremely creepy scenes. It's definitely still corny, but things like forcing you to light candles one by one in a dark room you know has a horrible evil with a sweet face in it are still pretty chilling. As it turns out, the mayor's daughter was murdered and cursed, and to save both her soul and the town, a purification ritual needs to be performed over three nights... but no healer who has tried has survived, possibly because this game is sort of bonkers. As mentioned above, the pace is so wild that most of my initial notes for the game were just "??" and "???" because the whole thing struggles with relating its plot in a coherent fashion. The innkeeper's tearful daughter begs you with one breath to save the soul of her best friend, and then casually mentions that while you're, y'know, looking up unspeakable dark rituals at the town library you could maybe bring her a recipe for her grandma's favourite cake. Kiddo, I am a little busy saving you and all the rest of the town from bloody end at the hands of a crazy twisted ghost, go Google it. And why do I need to find coins to pay for the herbs necessary to save this entire town from death and destruction?! (Why do games never give me a "slap upside the head" option when I really want one?) The game takes place over several nights, each with a different ritual, but things begin to come together better after the end of the first when you're given a chance to learn a bit more about the town and its people, and how they fit into the plot. 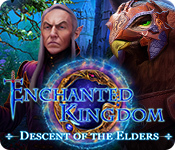 Consider Haunted Legends: The Secret of Life like a baby deer learning to walk... kind of weird, gangly, and shaky, but ultimately pretty darn good at trotting along in short order. The game is available in both Collector's Edition and Standard flavour, though whichever you choose will get you several hours of play (not including the bonus chapter available only in the Collector's Edition), and if you're looking for a game that has a few twists and turns on top of some admirable chills and dark magic, they'll be hours well spent indeed.